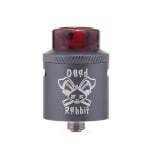 The Dead Rabbit is a 24mm RDA from Hellvape, designed by Heathen. It features a unique 4 post design with top down terminal holes and downward angled air intakes, and includes a bottom feed squonk pin. The Dead Rabbit by Hellvape, designed by Heathen is a 24mm RDA that features a unique 4 post design with top down terminals and side mounted screws. Similar to a postless configuration but raised off the deck, this allows legs to be trimmed off the coils after installation. Dual adjustable side airflow channels are angled downward to maximize air circulation minimize leaks, and the knurled top cap can be twisted to block one intake completely for single coil builds. Flathead terminal screws are installed, and four hex backups are included. The cap securely attaches to the base with 2 o-rings, creating a 5mm deep juice well. A bottom feed 510 pin is also included, allowing you to supply juice directly from the base of the deck with your favorite squonker mod. The Dead Rabbit includes a 10mm bore 810 Delrin drip tip, another 10mm bore 810 drip tip made from uniquely colored resin (will vary), and a 510 drip tip adapter. Doesn't come with the tiny flathead screwdriver it need and make sure to buy coils because it doesn't come with any.. Picked up this bad boy as a Christmas gift to myself, and WOW merry Christmas to me! Amazing vapour production and great flavour with 0.2 clapton coils. Best decision I’ve made in a while. Amazing deck - simple and beautiful. Insane airflow and flavor. Gorgeous. Sick RDA, incredible flavour with the high build airflow. All you flavour chasers out there, take note!